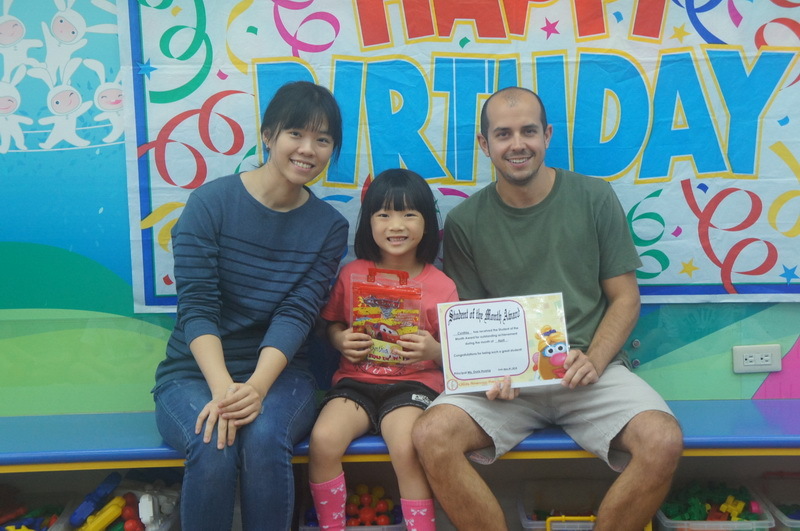 Lauren: Cynthia has done a fantastic job at everything in the class! She is always one of the first students to complete her work in a correct manner and her work ethic is great! She loves to share with her classmates and is always working on making her grammar better. WELL DONE!! Sean: Cynthia is always very cute and kind to everyone. She always regards everyone as a friend, regardless of who it is. I am very grateful that she’s always kind-hearted to accompany everyone, whether it’s playing or studying and will actively participate in answering questions in class. Even though sometimes she’ll forget to answer, she always tries to show her best side. She’s a great girl. Congratulations Cynthia. Runa: Billy is a very smart boy who is always ready to tell a joke in class. Although he can space out during class, he still learns all of the material. He is very good at Phonics and follows directions for the pages very well. Good job, Billy. Tom: In April, Billy is our Super Kid! He is a smart boy. He understands and remembers what the teachers say in a short time. He likes to share his toys with his friends, he is friendly to everyone, too. Tiffany: Wesley is our Super Kid. He did very well in the story telling competition and has shown a lot of improvement with reading and Phonics. Good job Wesley and keep up the good efforts. Jason: For this month of April, Wesley has been chosen to be Super Kid. He has improved a lot in reading and Math. He is good at writing and he did a very good job in the Story telling competition. Good job, Wesley. Keep it up. Joyce: Our Super Kid this month is a student who has been good all semester long. She comes to class ready to learn and she is always the first one to volunteer. Her English has improved a lot and she is able to have a conversation in English with ease. This student is very caring and she loves to draw. She has also made a great effort to show up to class earlier. We are very happy to have Lisa in class. Keep up the great work! Cesar: This month our Super Kid in Puma is Lisa. She tries her best to say many words and sentences in English. She likes to share her toys with everyone. She also likes to take care of her classmates. When her classmates feel sad, she will give them a hug. We’re very proud of Lisa in Puma class. Chelsea: Matthew is our Super Kid for the month of April. We’ve noticed Matthew has been doing well for a long time. He’s never had issues with lessons, and we’ve watched as his behavior has grown and matured. We feel he’s more than ready to graduate into grade 1, and what better way to celebrate this than Super Kid! Congratulations, Matthew, and keep up the great work! Stacey: Sharlene is our Super Kid for April. Sharlene is always such a wonderful girl with an enthusiastic and playful personality. She also is such a hard worker in class and tries so hard to always write words in Phonics class so beautifully. She is also always trying to test her skills in Math by asking the teacher for different math problems. Sharlene is a wonderful student and I am very proud of her. Julia: This month our Super Kid is Sharlene. She is a nice and sweet girl. She is nice to her friends. Everyone likes to play with her. She likes to share her toys with everyone for toy sharing class. During class, she pays attention and she participates in every lesson. She likes to join all the activities. She also tries her best to do everything even if something is hard but she still tries. Good job Sharlene! Keep it up.